So how should we interpret Mr Hockey’s statements? 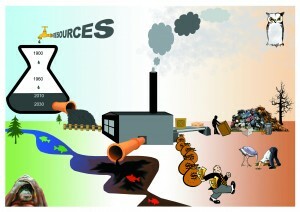 We live on a finite planet with a supply of natural resources upon which we totally depend. Our economy (a set of rules that we humans devised for our benefit) is built entirely on these resources. So, if we are not to “squander our children’s future”, it is imperative that we “live within the means provided” by only using these resources at a rate that is “sustainable” – it would be immoral to do otherwise. Maybe there is a sense of “entitlement” that exists in some communities, where generations of people have simply lived off the state. So why didn’t Mr Hockey add a carrot to the big stick to change this culture of entitlement? What about a policy to encourage change through education? Oh hang on, this was also cut. What about promoting self-fulfilment and hope? Not easy, but at least give it a go. There is also of course an “entitlement” culture that exists amongst some of the wealthy, who hide behind grey tape1 to effectively launder money around and legally avoid paying tax. In 1952, 4,000 people died in London as a result of excessive smog. This necessitated stringent laws to clean up, which over time duly happened and London is the better for it. But until then, pollution was a cost passed on by companies to society. These business barons felt entitled to simply dump their pollution in order to maximise profits. Certain leaders in society feel entitled to cut down 400-year-old forests for paper pulp, contaminate the Great Barrier Reef to construct a coal terminal at Abbot Point (aptly named), produce products destined for waste dumps because of built-in obsolescence, and of course produce emissions that are threatening us and our “children’s future”. The “age of entitlement” of being able to destroy a shared resource for personal gain must end. The evidence of only 20% of original forests left, 10% of large fish stocks, extinctions 100 times that of natural background, and of course the famous hockey stick graph that shows the rapidly changing climate, is so overwhelming, yet is being ignored in favour of the entitled few. All these costs – known by economists as negative externalities (they certainly have a way with words) – are real and won’t go away with the magic wave of a hockey stick. Either companies pay now or society pays later – a simple choice, yet in the interests of short term economics the latter is chosen. Economy translated means home management. Squandering our inheritance (the earth and all its resources) is not my idea of good home management. Current neoliberal economics puts zero value on nature and its processes such as producing oxygen from carbon dioxide, photosynthesis and converting dung into food. Yet it puts an enormous value on so-called improvements such as processes that convert sugars and syrups into obesity-related soft drink that is served in a throw-away can. This is not to say that we shouldn’t partake of these offerings, but at least apportion things a fair value and let the user pay the full price. Just as a prosperous business depends on its people and systems, so too a prosperous economy depends on its people and ecosystems. Australia – with probably the most favourable economy worldwide – can show real leadership in how to improve wellbeing and also tackle sustainability and climate change. The risks are high. The stakes are high. The Clean Energy Package must stay; otherwise this could be a dark moment in our history as we turn our back on humanity. As a priority, we need to retain the price on carbon and renewable energy initiatives, known as the Clean Energy Acts and Regulations. Retaining the carbon tax would also circumvent the need for some other taxes and budget cuts. It is extremely unfortunate that an issue as critical as greenhouse emissions have been treated as a political football by both major parties; a sad indictment of our political system. “Axe the Tax” needs to be hit for six by the big hockey stick; “Axe the Axe2’” instead. So Joe, we do need to be “sustainable”, “live within our means”, “not squander our children’s future” and end “the age of entitlement” in the interests of a “moral dimension”. ‘Grey Tape’ is the set of rules, regulations and laws that allow people to pass on their costs and risks (often through Limited Liability companies) to society at large. This entry was posted in Climate change, Economics, Education, Environment, Uncategorized and tagged budget, climate change, economics, education, environment, politics, sustainability, sustainable by Graham Davies. Bookmark the permalink. Graham is a Chartered Engineer with 25 years’ experience in energy, infrastructure, mining and manufacture in senior leadership roles in the corporate sector as well as board positions in NFPs and small business. He has a keen focus on creativity/innovation with 3 commercialised patents, composed numerous songs and written challenging articles particularly on the economy and sustainability. I couldn’t agree more Graham, what Joe refers to as “the age of entitlement” obviously only relates to those who feel “entitled” to live modest lives, perhaps without working to support that life. Is it any less morally problematic for the wealthy and influential to maintain their sense of entitlement to dictate public policy to advantage themselves? Nathan Tinkler is the perfect example. It’s been reported that evidence presented to the NSW ICAC hearings indicated that he had a fit when his developments were not approved 2 weeks after a State election where he bankrolled politicians campaigns. While Joe may feel free to kick welfare recipients, he does not deserve to be taken seriously unless he addresses corporate welfare and corruption and truly ends a societal “age of entitlement”.